Just my opinion but the car is pretty damn heavy as it is so I would think that using the existing T-Bird crossmember and bolting on a set of tubular uppers would be easier than trying to mod the CV front end, as heavy as it is, to make it fit if handling is what you are looking for. Not sure if the Galaxie or Mustang ones will fit the 'Bird but it would be worth looking into. Is the track width for the CV the same as the 'Birds? Also, since the CV incorporates the spring perches into the crossmember will you be eliminating the shocktower sheet metal to free up room for headers and a larger motor? If you can do the fab your self then I would think the CV swap would be worth it but I would look for something a little lighter if your going to go to all the trouble. Looks like a really cool project! I'm going to keep an eye on this one!! I've pondered the CV swap for my 66. The crossmember, spindles, and steering rack housing are aluminium. The whole assembly is a pretty reasonable weight, but sturdy enough to support a full-size car obviously. Thanks for the replies as I said I've got to do my home work but the Crown Vic has a track width of around 63 inches and the Jag is narrower around 59 inches. The Bird I'm guessing is around 60 inches so if this is correct either are not far off. The CV is aluminum alloy and is light but because its an alloy you are limited to the bolt in option. By eliminating the shock towers you will have plenty of room for any FORD power plant. Actually the Jag may be much easier as it is metal so you can easily weld to it or even fab up some connection points and bolt it in as designed. Note the front and rear suspension to frame connection points. Not knocking the original tbird suspension but with a little work you can check a bunch of upgrade boxes off the list. Dated pics of my Uni project. If its inappropriate to post a non Bird please excuse the newbie and delete. Track width for '62 Tbird: 61 front, 60 rear. I wondered about this kind of mod as well, using both front and rear CV suspensions. I like the idea of modern 4 wheel disc brakes, and prefer coils over leafs. The one thing that concerns me is safety in case of an accident. IIRC, unibody construction was advertised as safer, having a wall of steel between the front of the car and the driver, in addition to the fender. If the shock towers are removed, that extra steel is gone. Great point. I think the unibody construction is safer because it provides more structure to absorb impact. I would put some structure in place of the shock towers. The towers are commonly removed in mustang, falcon and TBolt projects and most commonly a Mustang II based suspension is installed. Im not a big fan of Mustang II. Sweet Truck! This forum is more than happy to look at quality work although some are a little OCD about concours! LOL! Just kidding! Most everyone on here are pretty civil about stuff so post away. I have a chevy project that has been going on for years. From the looks of your truck I think you'd like how and where the Nova project is going. PM me if you'd like to see it and I'll send you a link to the project. The difference in track width for the CV stuff could be made up with higher offset wheels. Since it can only be a bolt-in, the important measurement would be the width across where the CV subframe would be bolting up to the T-Bird chassis. Im going to have to get some measurements together to see how doable the CV swap is. Found this on Utube not a CV swap but very similar concept. Keeping my Rocketbird fairly stock, but I am putting XJS IFS/IRS under my 1941 Chevrolet Coupe. Will be a total sleeper with a nice taildragger stance. 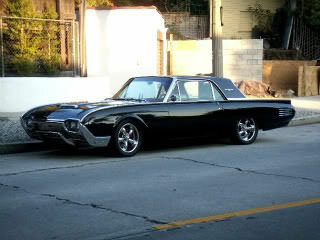 "Keep Cool, Little Thunderbird Ford"
I kept thinking about this.....A Rocketbird that drives and rides like a Jag. Looking closer into this, XK6/XJS are easy and cheap to find. I was going to order headers for my '62 from one of the well known bird.com type sites. Was wondering how/if they would fit. I was hoping sine they are bird people, that they would say something on their site about needing body mods to fit the headers. I didnt see anything about that. Do you folks have any experience fitting "bird specific" headers without mods to that inner wheel well area? It does look dang tight in there. I dont have the original engine, but it is relatively period correct FE 390, so I presume it either will or wont work just as if I had the original block in there?